Akashic Books has posted my short piece, "First Time, Last Time", for their supplement, Thursdaze: Original Flash Fiction Under the Influence. 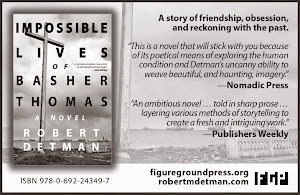 This is an excerpt from my forthcoming novel, Impossible Lives of Basher Thomas. (See the wonderful cover at left.) This piece is not, I repeat, not autobiographical! About the Drug Chronicles Series: Inspired by the ongoing international success of the city-based Akashic Noir Series, Akashic created the Drug Chronicles Series. The anthologies in the series feature original short stories from acclaimed authors, each of whom focuses on their fictional experience with the title drug. Current releases in the series include The Speed Chronicles (Sherman Alexie, William T. Vollmann, Megan Abbott, James Franco, Beth Lisick, Tao Lin, etc. ), The Cocaine Chronicles (Lee Child, Laura Lippman, etc. ), The Heroin Chronicles (Eric Bogosian, Jerry Stahl, Lydia Lunch, etc. ), and The Marijuana Chronicles (Joyce Carol Oates, Lee Child, Linda Yablonsky, etc. ).